Is Price The Only Thing That Matters In An Offer? Price is a big thing when you make an offer on a West Knoxville home. But, is it the only thing that matters when you make an offer? In this post, we’ll take a closer look at what factors are important when you make an offer on a West Knoxville home. Why Is Price Such A Big Factor? Price is obviously a big consideration in an offer. It’s what has the biggest influence on what proceeds end up in a seller’s pocket at closing. This is why it’s a huge consideration to sellers when they receive an offer. For a seller, when they receive an offer on their Knoxville home, they’’ll want to consider if the overall price meets their needs. The seller will want to consider how long their home has been on the market, what other homes are selling for in the area, and what their financial goals are for when they sell their home. 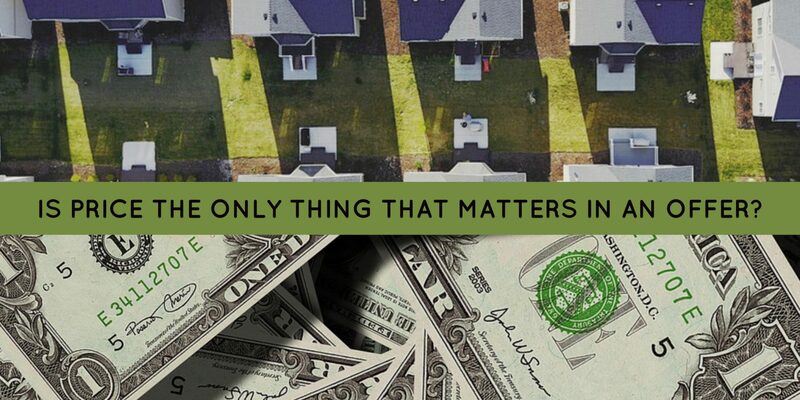 While price is a big consideration when making an offer, it’s not the only thing that matters. While price may be a very important factor in offer acceptance, there are a few things that you can do to help tilt the odds in your favor when you make an offer instead of upping the price. Cash offers can go a long way in wooing a seller. While this may not be an option for many people, if you are paying cash, it can go a long way. Cash purchases tend to be slightly easier transactions, since there isn’t the mortgage approval to deal with or the appraisal. They can also mean that it’s possible to close quickly. For many sellers, they may be willing to accept slightly less of an offer for a cash buyer, so long as a buyer is able to show proof of funds. Concessions are other items that you ask a seller to pay on your behalf. Most commonly, these are closing costs or a home warranty. These items can cut into a seller’s bottom line, especially when you ask for a home warranty and closing costs. If you’re wanting to get your closing costs paid, consider upping your purchase price to cover the closing costs. This will make your offer more appealing to a seller. The ability to close quickly and easily is important to most sellers. Sellers do not want a difficult transaction where the deal falls apart mid-transaction. When you make a clean offer, clear of difficult contingencies, you’ll make it much easier for the seller to say yes. Just bear in mind, you don’t want to waive your right to contingencies that protect your best interest like the financing contingency, appraisal contingency, and inspection contingency. Depending on a seller’s situation, the close date can be very important to a seller. They could want to close quickly or they may need some time to find a new home. Regardless, if you’re able to be flexible with the close date, it can be a very important factor to a seller. For good reason, price is a big reason for offer acceptance. So when it comes to writing an offer, it the biggest factor that you should consider. These other items are just icing on the cake. They can help sway a seller to choosing your offer when you’re in a multiple offer situation. Are you looking to buy a West Knoxville home for sale? If so, please let us know if there is anyway we can assist you with your home search. You can contact Rick at 865-696-9002 or via email at Rick@KnoxvilleHomeTeam.Com. You can contact Kati at 865-392-5880 or via email at Kati@KnoxvilleHomeTeam.Com. Also, be sure to check out our West Knoxville Home Search Page to see what homes are for sale in the Knoxville area.